Democrat Gretchen Whitmer and Republican Bill Schuette represent a clash of party approaches to fixing the state’s roads, bridges and struggling public schools, offering voters a clear choice in November. 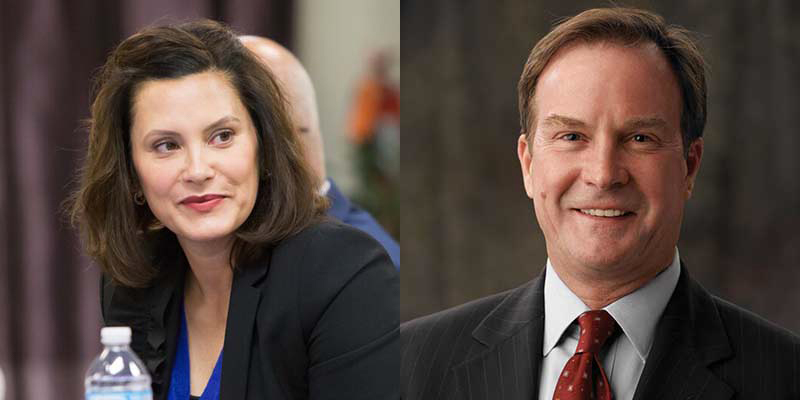 With Michigan at a crossroads, Democrat Gretchen Whitmer and Republican Bill Schuette, who won their parties’ primary contests Tuesday, offer a stark ideological contrast as they battle for the governor’s seat this November. Whitmer, the state’s former Senate Minority Leader, trounced progressive darling Abdul El-Sayed and Ann Arbor entrepreneur Shri Thanedar on the Democratic side. Schuette, the state’s attorney general, made short work of Lt. Gov. Brian Calley and other GOP challengers. The victories pit a more moderate Democrat with strong union and establishment support against a Republican veteran who has tied his fortunes to the popularity of President Donald Trump among his conservative base. Each will be challenged to shore up support within their parties after primaries that turned bruising over the summer, even as they try to poach swing voters who went for Trump in 2016 but are now showing exasperation with the president. The winner inherits a state that made broad economic gains under Republican Gov. Rick Snyder following the Great Recession. But it’s a state that continues to face significant hurdles: Terrible roads and crumbling infrastructure. Public schools that trail much of the nation. Environmental challenges ranging from continued water woes in Flint, to Great Lakes threats and chemical contaminants in the ground. Too few young people going to college. Not enough workers to fill skilled jobs. Whitmer, like her vanquished Democratic rivals, favors significant investments to improve education and rebuild roads, bridges and other infrastructure. Schuette, like his Republican rivals, vows to shore up education and roads while at the same time calling for less government and lower taxes. "We are standing here primed to win in November," Whitmer, 46, said during her victory speech late Tuesday in Detroit. She said she was proud "to be on a Democratic ticket that was having a great debate among the most diverse group of candidates in Michigan's history. I extend a hand out to them. ... There is a place for you as we move forward. I appreciate your spirit and your energy." It was a high-stakes primary for a party that’s hoping to ride a “blue wave” to power in Lansing and is still grappling with internal fault lines exposed during the 2016 presidential election. The contentious primary season begged the question: Would the Democratic Party bank on a battle-tested Democratic politician with existing inroads in the party apparatus, or veer left and elect an inexperienced but optimistic and charismatic progressive in El-Sayed, who proposed sweeping changes? Tuesday’s results indicate the former, a disappointment to the progressive voters who thronged to El-Sayed’s campaign barnstorming in the primary’s final days. "As frustrated as you may be, I need you to put that aside tomorrow and fight to make sure Bill Schuette is not governor of the state of Michigan," El-Sayed told supporters in his concession speech. Mariam Jalloul, 24, of Dearborn, worked the phones for the El-Sayed campaign. She predicted Tuesday night that his supporters will now back Whitmer to prevent another Republican from becoming governor, following two terms under Snyder. "Abdul already indicated that if she wins, he will get behind her,” Jalloul told Bridge. “The presumption is that his voters will, too." Whitmer ran on Democratic planks such as shutting down the Enbridge Inc.-owned Line 5 pipeline beneath the Straits of Mackinac, increasing funding for education and infrastructure improvements. But her policy proposals were reliably more moderate than those of her competitors, El-Sayed and businessman Thanedar, who pushed for a single-payer healthcare system and tuition-free, four-year college for most Michiganders. Schuette, 64, led his three primary challengers by sizable margins in polls, relentlessly touting his fealty to, and endorsement from, President Trump in debates and on the campaign trail. And he carried that wide lead into the unofficial results Tuesday, far outpacing Calley, state Sen. Patrick Colbeck, of Wayne County, and Saginaw obstetrician Jim Hines, who ran as an outsider in a field of candidates with government experience. Schuette spoke to supporters from an election-night party in Midland shortly before 10 p.m. Tuesday. A few minutes later, Calley conceded the race in prepared video remarks. Schuette said it was his hope that state GOP voters can move forward from a dividing primary and unite behind the common goal of providing more jobs and paychecks to Michigan families. He turned his sights to Whitmer, of East Lansing, saying that her policies would take the state backward. The Republican primary was notable for contentious exchanges between Schuette and Calley. Schuette has been under fire for allegations, including from Calley, that he misused his public office for personal and political reasons — claims that may prompt a criminal investigation — while Schuette’s campaign attacked Calley for pursuing a master’s degree at Harvard University, insinuating that he skipped work on the public’s dime to do so. "The reality is, this is President Trump's Republican Party," Calley said in his concession speech. "His chosen candidates win Republican primaries. We see it happening all across the country. And so I want to say to Bill Schuette: Congratulations." Calley said he hoped to work with Schuette to unite Republicans to win in the fall. The primary campaign was, in many ways, a referendum on GOP support for Trump. The controversial president is popular among Republicans, though political observers have said that the winner of Tuesday’s primary will need to temper his support of Trump in order to win over moderates or independent voters in November. Schuette has said he wants to be Michigan’s jobs governor and is running on what he calls a “paycheck agenda.” He has advocated for rolling back Michigan’s income tax rate, as well as improving K-12 literacy and reforming the state’s no-fault auto insurance system. In the Libertarian primary, Bill Gelineau, a title insurance agent from Lowell, had a wide lead over John Tatar, a former U.S. Army Reserve lieutenant colonel and a retired teacher from Redford, with 84 percent of precincts reporting early Wednesday in that party’s first contested gubernatorial primary. The choice for governor of Michigan is between a woman and a republican that is covring up for a murder and a governor who ORDERED the poising of the city of Flint, who also help destroy OUR public schools<<< the chice is clear to people that rae not brain damaged fox news watchers!! Wow Don - between a woman and a republican (what does that mean???) Did you even graduate from HS? covring????? poising???? chice??? rae???? I think you need to not worry about brain damaged fox news watchers - you need to worry about learning how to spell. I was hoping these comments were better moderated. What I saw was Dem candidates all across the spectrum running strong campaigns that addressed the issues that their voters are interested in and support. That's politics. It's smart. And it shows a big tent, not fractures within the party. Here in Michigan a lot has been made of the differences between Whitmer (as an "establishment" candidate) and El-Sayed (as an "insurgent"). The truth is these 2 candidates hold virtually identical policy positions across the board, and their differences are more matters of degree than direction. In any event, headlines like this one do nothing to move the party forward to November. What I see happening is that we are learning--slowly--from the lessons of 2016, and while we may disagree on some matters internally, I'm hoping that we are smart enough to realize that the stakes are far too high to let those disagreements get in the way of our voting in November. Let's not leave off Schuette's waste of tax payer dollars pursuing his bigoted agenda -his attempts to deny civil rights to Michiganders.